Your loveliest home look is probably already in your cabinet! 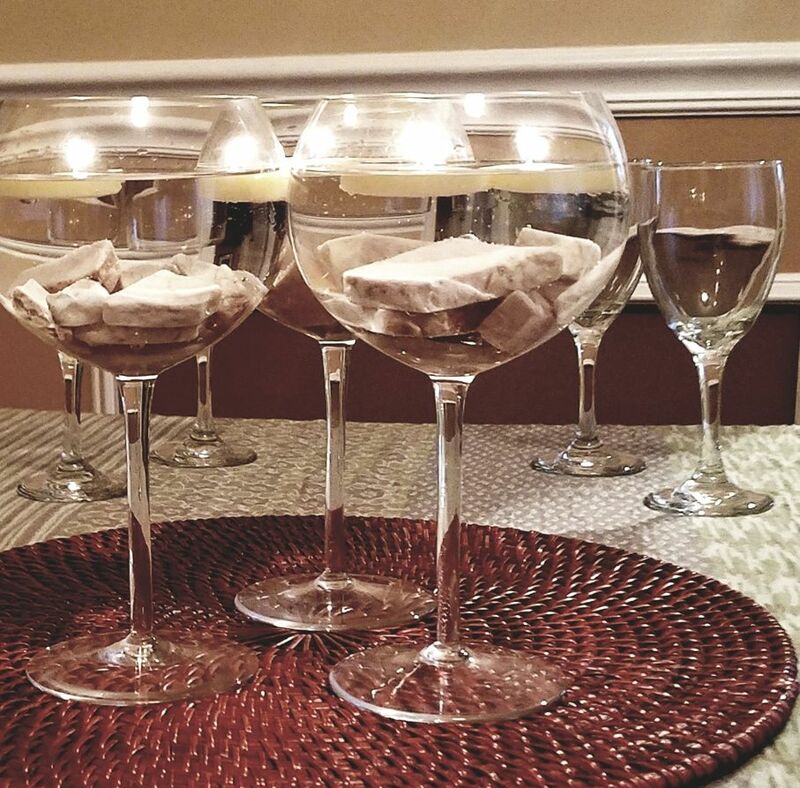 Beautify any room with these fun and simple wine glass hacks. The world of wine glasses can seem a bit intimidating. There are literally dozens of different variations, each catering to a specific family of wines for optimal enjoyment of nose and flavor. For the novice (that’s me!) it’s dazzling, but at times a little confusing, too. But there is one thing that all wine glasses seem to have in common: visual appeal. Sure, high-end crystal may be the top of the toasting pyramid, but even everyday wine glasses boast lovely silhouettes in a host of sizes and shapes. Connoisseurs and dabblers alike can appreciate the simple elegance of the vessel. So, why keep all your wine glasses tucked away, waiting for the next chianti to come along? Bring that beauty out full time with these five easy ideas, and say “cheers!” to your latest home décor hack. I’m not saying you should repurpose your Lenox collection into interior design components. There are some great display options that allow fine glassware to be visible without putting it at risk. As for getting your hands on wine glasses for repurposing, there are definitely options. The first is buying either inexpensive singles or an affordable set from a store. Dailyware at Bed Bath & Beyond is a great example of affordable glassware. You can get a four pack of most styles for around $10. or single glasses for $3 or $4 each. The second option is hitting thrift shops and tag sales, and hunting them down on the cheap there. In either case, you can probably score six to ten wine glasses for $20 or less. Want to make that money well spent? Check out these tips! If you’re fresh out of beautiful living room ideas, here’s some inspiration. This is a fabulous look for an accent or console table. Mixing and matching is the key—have fun with it! Inverted glasses can be used as pedestal candle holders, and of course, upright glasses stand in for traditional votive holders. Just remember that the more enclosed the wine glass, the more it retains heat, and the faster your candle melts. Glasses for whites are generally more open at the top and therefore work better as votive holders than the reds do. Don’t know a lot about wine glasses? Don’t fret. There is an abundance of wine glass charts available online to guide you, and any glasses you buy new will be well labeled. I honestly think I’ve learned more about the myriad differences amongst wine glasses while experimenting with them as candleholders than I have while actually drinking wine. Votives on the pedestal style inverted glasses will melt more slowly, but they will eventually drip. Depending on the size of the foot of your glass, your candle may runneth over before it burns out, so think about what the glass is standing on. I have my grouping set on a glass top accent table that won’t be harmed by wax. Coasters, china plates, or trays are other options. You can also look for drip-free votives, but they are much harder to find than drip free tapers. 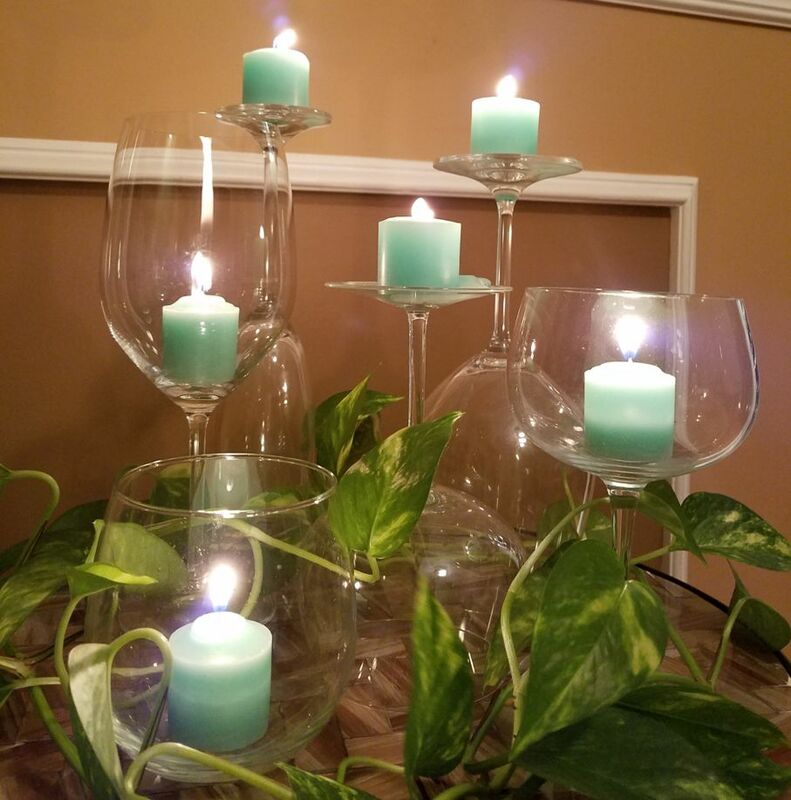 As far as finishing the look of your wine glass candleholder arrangement, the sky is the limit. I love the look of natural elements like the live vine shown here. If you have indoor or outdoor ivies that need to be cut back, it’s an easy and beautiful addition. Dried flora, shells, and river rock are great options, too. You could also go with holiday decorations or even a photo display. If your candle arrangement is going to be a permanent part of your room design, you can change it up with the seasons and holidays. This is one of my favorite decorative kitchen ideas. I have these succulents right above the sink in our bay window, but you can put them pretty much anywhere sunny. All wine glasses are created equal for planting use. Just make sure you select plants that will fit comfortably, with a little room to grow. Personally, I love the look of stemless glasses for this, because they are casual, yet lovely. If you have a charcoal thumb (as I do), succulents are the plants for you. They aren’t demanding. Just give them lots of sun and a little bit of water, and the prepping part is a breeze. First, put a layer of pebbles in the bottom of your glass. This is important because succulents need good drainage. Next, put a layer of moss over the pebbles. This will keep your soil from filtering down into the pebbles. I used Zoo Med terrarium moss, which I had on hand for my frog’s habitat, and potting soil made especially for succulents. Next, fill up the glass more than halfway with your soil. You want to make sure the soil is deep enough to surround and support the root ball of your plant. Remove the succulent carefully from its container. If it’s rootbound, you can twist it, but be gentle. Now, plant it in your glass, making sure that it’s stable, with roots completely covered. 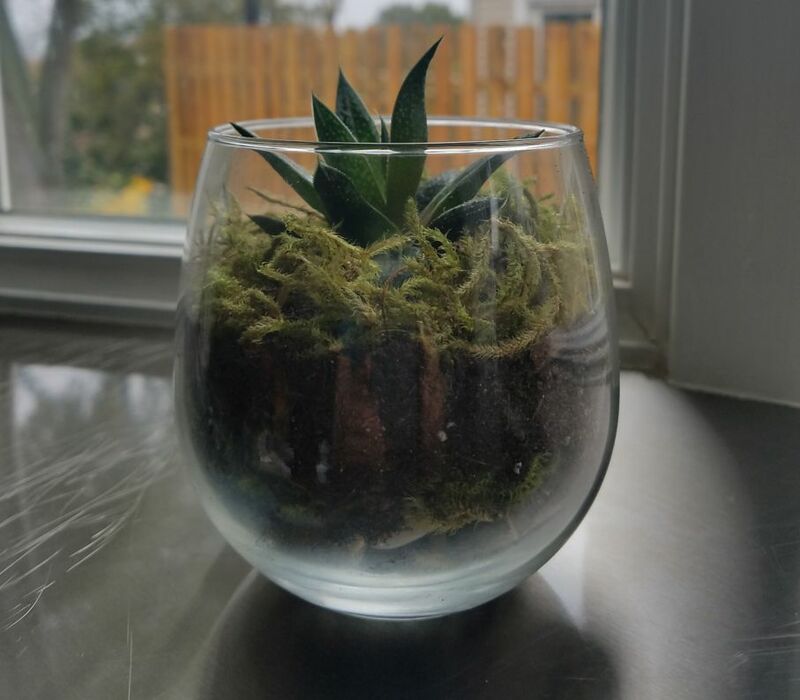 Once your succulent is snug and comfy in the glass, top the soil with a bit of moss. This isn’t necessary, but it makes your succulent glass look neat and finished. If more moss isn’t your thing, you can top with sand, or just leave it as it is. Caring for your succulents is even easier than the prep. Keep them in a bright, sunny spot, and give each one about a teaspoon of water per week. 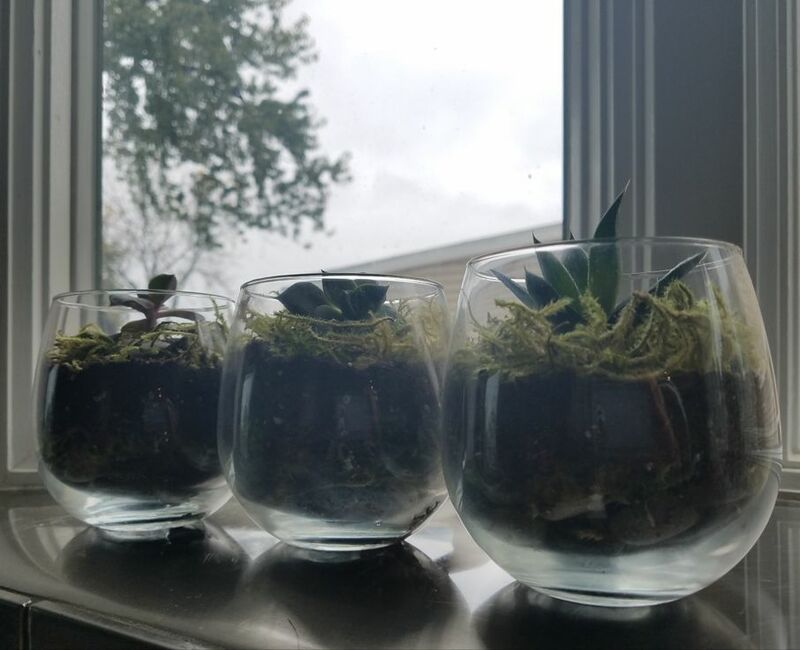 If you don’t overwater or underexpose them, you can’t fail. Now you’re done! Don’t they look fantastic? 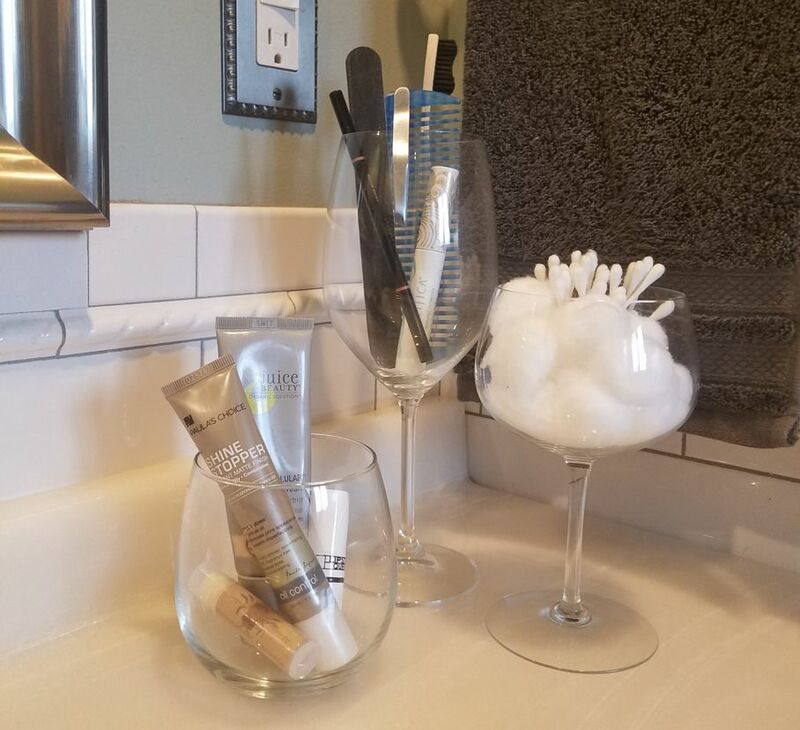 Wine glasses also do a great job storing necessaries and pretties “at the ready” in the bathroom, especially when space is tight. Why buy a cotton ball dispenser, a toothbrush holder, and a cotton swab holder if you have a few wine glasses to spare? It’s also a good hack for daily makeup or other things you want to use on a daily basis without hunting through drawers. Bonus: they match everything. Two or three glasses look organized and attractive on a shelf or the sink vanity, but I wouldn’t do more than that. Small bathroom ideas work best when streamlined. The goal is neat and appealing, not overfilled and cramped. My grandparents were wine drinkers and handed down several different sets of glasses that eventually came to me. I love the coupes, because not only are they elegant and old-timey, but we actually use them upon occasion. My least favorite had been the goblets. Although they are lovely, we have never used them-- they are simply too big. As far as wine glasses go, I would classify them as between very large and enormous, and can’t imagine actually drinking out of them, attractive as they may be. So, I found something else to do with them. It turns out that too big for drinking is just perfect for floating tea lights. Odd numbers make for better centerpieces, so I went with three. Each goblet holds two tea lights without crowding. If you like, you can fill the bottom your goblets with sea shells, glass beads, or whatever suits your fancy. I used unfinished marble chunks that I got at Michael’s in the floral arrangement department. There are only two “must haves” here: water, and, of course, the tea lights. You can buy tea lights made especially for floating, but you can also easily modify standard, "buy by the bag" tea lights almost anywhere, and for less money. 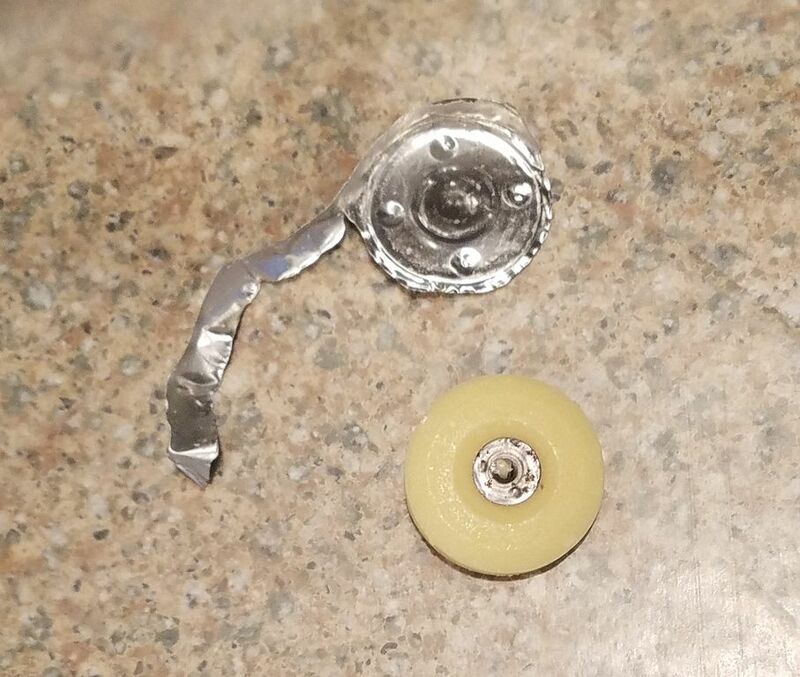 First, pop the candle out of its little metal wrap. Next, flip it over. See that small metal circle on the underside? This keeps the wick centered, but it doesn’t make the wick waterproof—floated tea lights will get waterlogged and snuffed out within a few minutes. Want to know what will make the wick waterproof? Melted wax. So, take a candle that is long enough to tip and drip (even a little birthday candle is fine,) light it, and drip the melting wax over that little metal piece. Once it is completely sealed, let it dry for a couple of minutes. So, to review: flip, tip, drip, dry, repeat. Voilá! Now, just float and light them. Pretty, huh? So, you have some gorgeous wine glasses that you want to display. You don’t want to fill them with stuff or use them for anything other than drinking wine. You just want to appreciate how good looking they are every day instead of hiding them away when they aren’t in use. I’m with you. Here are the two easiest ways to do that. The first is keeping them in an open-fronted, or glass door cabinet. They are protected from dust and accidents, but visible. This can be done in a kitchen cabinet, a china cabinet, or even a repurposed book case. If these options aren’t available or affordable, consider checking out used furniture on Letgo or Craigslist, or at a tag sale. Keep in mind that you will likely need to transport whatever piece it is that you’re buying, so be aware of size before you commit to a purchase. And I’d recommend steering clear of antique and consignment shops—their prices are likely to be just as high as new furniture, in some cases even higher. A second display option for showing off your glassware is a hanging rack. This could be built into a bar unit, part of a free-standing piece, or a simple addition that you can purchase and hang under a cabinet or on the wall. 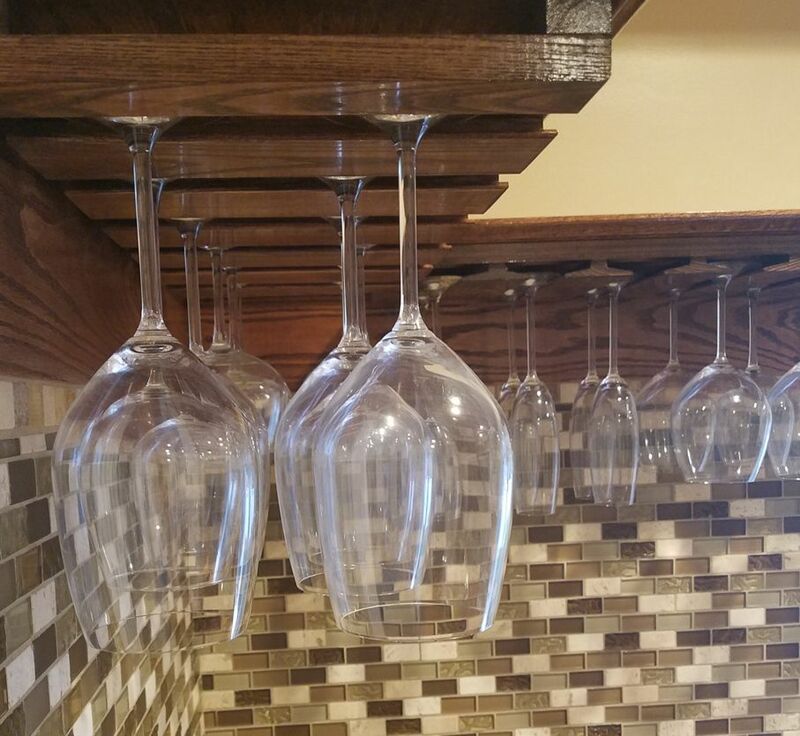 Target, Bed Bath & Beyond and similar stores all sell wine glass racks starting at about $15. Hanging glassware looks elegant and saves space. The only downside is that you may have to dust your glasses occasionally or put them through a quick dishwasher cycle. 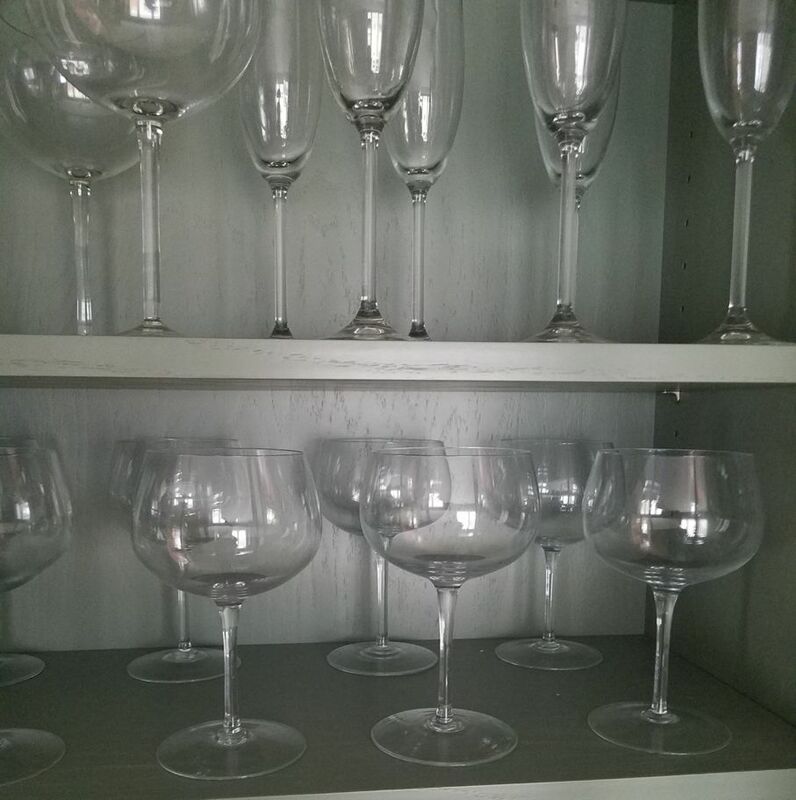 On the other hand, if you use your wine glasses often enough for regular washing, they’ll stay shiny and dust free. So, call up a few friends, grab a few bottles, and keep those flutes fabulous! As you can see, there are plenty of interesting ways to do it! What’s the best thing about wine glass décor? That it’s an affordable way to bring a touch of elegance to your home? Maybe it’s the opportunity to get creative, and have a little outside the box fun with a new look? I say, yes and yes! It’s a win-win decorating success. Enjoy trying out these ideas, and who knows, you may come up with a few of your own too. So, go ahead and have another glass!